Cavan midfielder Gearoid McKiernan is set to receive a two-match suspension after the referee's report of their win over Monaghan contained details about "comments of a sectarian nature". McKiernan and Monaghan pair Drew Wylie and Paul Finlay were sent-off after a 60th-minute row at Breffni Park. McKiernan and Finlay got straight red cards and Wylie a yellow and a black. Referee Sean Hurson submitted his report on the McKenna Cup tie to Ulster Council officials on Tuesday night. A fourth player, Niall McDermott, was sent off on a double yellow card for an unrelated incident. McKiernan, who kicked three points during the match, is expected to be officially informed of the ban on Wednesday and has the choice of accepting the proposed suspension or seek a hearing. If he decides to request a hearing and is found guilty, he then he has the option of appealing the ban. The suspension is applicable only to the same competition, but seeing as his red card automatically rules McKiernan out of Wednesday night's McKenna Cup semi-final against neighbours Fermanagh, an appeal might be unlikely. This is believed to be the first instance that a red card has been deployed as a punishment for either racist or sectarian abuse after the GAA changed the rule at last year's Congress at Croke Park in February. 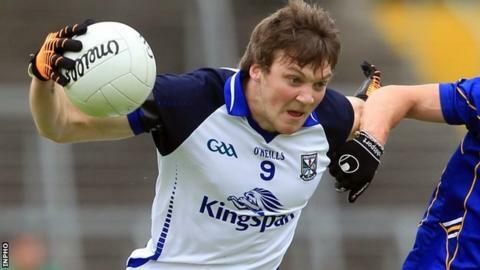 Wylie's foul on Martin Reilly ignited the row which ended with the Monaghan defender and Ballybay clubmate Finlay being dismissed along with Cavan's star man McKiernan. The Ulster Council of the GAA have confirmed that a player has been cited in a match report, although they have yet to confirm the precise nature of the offence.